NOTE: As of July 2011, Perple_X 6.6.6+ is the default version of the Perple_X. An unfortunate consequence of the change in versions is that most of the examples and tutorials referred to here are out of date. The out-of-date examples and tutorials are, in most cases, useful because the basic information passed between the various programs has not changed although many of the prompts have been eliminated or reordered. Daniele Castelli and Chiara Groppo's Perple_X (6.8.6) tutorial for petrological problems. This tutorial consists of 13 exercises that comprise the practical part of a 30-hour advanced course on “Petrologic phase diagrams: principles and computations” periodically offered to PhD students at the University of Torino. Niigata phase diagram section workshop (2019). Problem for the practical of a 1-day course on phase diagram sections. Craig Bina's geophysical phase diagram tutorial (20171). Problems relevant to mantle geophysics. This tutorial may be usefully combined with the Perple_X phase diagram section and extraction of rock properties along a path tutorials. Jesse Walter's metapelite phase diagram section tutorial (revised 20171). Guides the reader through a phase diagram section calculation with explanatory commentary. Lausanne metacarbonate workshop (20161,2). Problems for the practical of a 2-day course on meta-carbonate + COH-fluid phase equilibria. Dave Hirsch's Perple_X petrological phase diagram tutorial (revised 20141,2). Phase diagram calculations (composition diagrams, sections, and projections) relevant to metamorphic petrologists. This tutorial is slightly out-of-date, and was written primarily for Mac OSX users; for WINDOWS users some lateral thinking may be required. This tutorial may be usefully combined with the Perple_X phase diagram section and, very out-of-date, composition and Schreinemakers diagram tutorials. Mark Caddick's files for the 2-day C2C Workshop on calculating phase diagram sections with Perple_X (20091,2) - this is not really a tutorial (for that you need Mark), but the PowerPoint presentations and exercises (see the 2nd PowerPoint presentation) may be useful teaching aids (to browse the files follow this link). The Perple_X tutorial (revised 20002) This tutorial is not current, so prompts and results obtained now with Perple_X may differ from those in the documentation. 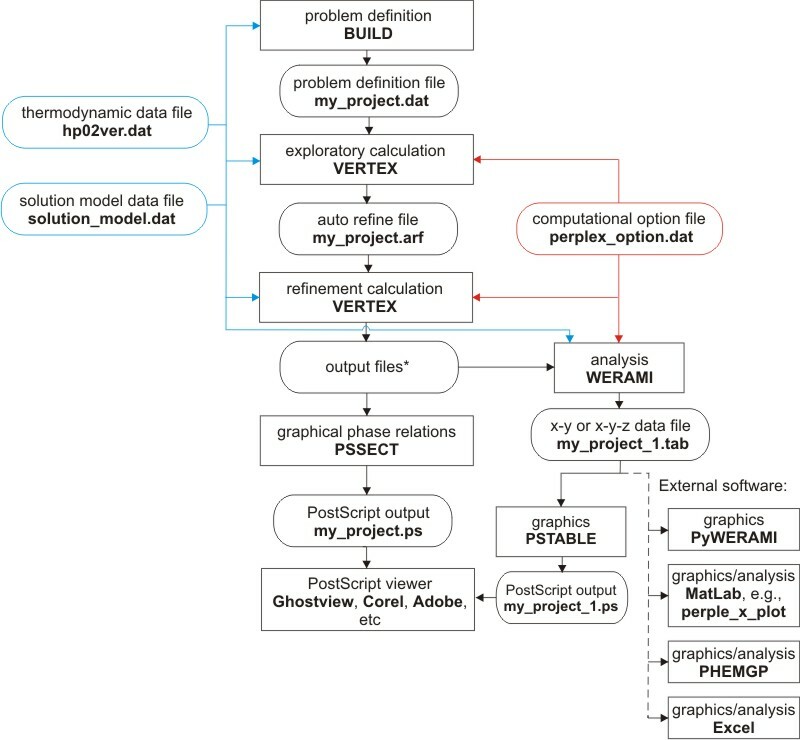 The tutorial may still be useful for learning how to use Perple_X for classical petrological phase diagram constructions (chemographies, phase diagram projections, and isopotential phase diagram sections). 1As of the 6.8.6 revision (January 24, 2019), the auto_refine_factor_X (X = I..III) options have been made redundant by the specification of an auto-refine stage value in the initial_resolution option. To implement changes to the auto_refine_factor_X suggested in these notes in the current version of Perple_X, set the second value of the initial_resolution option equal to the old_initial_resolution/auto_refine_factor_X, where old_initial_resolution is the value of initial_resolution used in the notes. 2As of the 6.7.4 revision (July 11, 2017), calculations of chemographies, iso-potential phase diagram sections, and Schreinemakers projections using Perple_X's original convexhull optimization strategy are done in the program CONVEX rather than in the program VERTEX as is suggested in these notes. If the current version of VERTEX is used for such a calculation, the user is automatically directed to use CONVEX. The Perple_X on-line documentation illustrates certain specific types of calculations. These illustrations often assume some basic knowledge of the Perple_X programs; for beginning users it may be more helpful to work through the off-line tutorial and/or examples. An on-line guide to example problems done with Perple_X. Neither of the pages below is updated frequently, therefore it may be useful to browse perplex/examples directly. The original technical documentation is a potpourri of different kinds of information on topics such as the equations of state implemented in Perple_X for compounds and solutions and the structure of various Perple_X data files. The technical documentation is not up-to-date and it is probably not a useful document for Perple_X novices. Links to various (user supplied) scripts and/or facilities that automate aspects of Perple_X. Scripting written for earlier versions of Perple_X may not function as written in current versions (6.6.6+) of Perple_X. runPerplexBatchVp a C-script to run multiple batch jobs (courtesy of C. Brenhin Keller). PerpleXWrap C/R/Matlab/Python wrapper for MEEMUM: Lars Kaislaniemi's wrappers have been updated by Julien Cornet for the 6.8.1 version of Perple_X. The wrappers allow C, Python, Matlab, and R programs to call MEEMUM as a subroutine for phase equilibrium calculations. The compatibility of the wrapper with Perple_X is determined by the common block structure in Perple_X, this does not change often. The current version (April 2018) is likely to remain compatible with future versions. Bob Myhill's Python cmake_perplex_script automatically updates this wrapper. OSX Apps that automate some simple, but often confusing, tasks with Perple_X under OSX, courtesy of John Schumacher. Some tips on how to run Perple_X under OSX, courtesy of John Schumacher. Paralyzer (Matlab script for fast, high resolution calculations with Perple_X). R Script for plotting Energy vs P/T diagrams, courtesy of JF Moyen (St-Etienne). See for groups.yahoo.com/neo/groups/Perple_X/conversations/messages/1560 discussion. github.com/bobmyhill/cmake_perplex, a Python cmake project to automatically update and compile Lars Kaislaniemi's PerpleXWrap C++/R/Matlab/Python wrapper for MEEMUM, courtesy of Bob Myhill (Bristol). github.com/bobmyhill/solution_limits, a Python script to convert THERMOCALC site fraction expressions to Perple_X species_limit_expressions, courtesy of Bob Myhill (Bristol). autoVertex - an OSX/Unix perl script that automates running VERTEX with the "auto_refine" option. This script is now obsolete if VERTEX is run with the "auto_refine" keyword set to "auto", however the script provides a template for scripts to perform other tasks. These are notes prepared (with emphasis on elementary), for short courses some years ago. The first part deals with some basic thermodynamic principles, especially G-X diagrams. The second part offers a brief (out of date) comparison of computational methods, and elaborates on aspects of Perple_X algorithms.